My mouse taint. Unintentionally looks drunk. I recently read this fascinating article by wine writer Simon J Woolf on mouse taint which Richard Hemming MW recommended to me. It's left me rather mindblown. I urge everyone to read it. It's worth noting here that Simon is a brilliant writer on natural wine, specialising in orange wine. He is writing a book that will come out next year which I am excited to read. "Mousiness is defined as a taint caused by lactic bacteria or possibly by Dekkera (AKA Brettanomyces)." I'm going to be honest - prior to reading this, I had no idea that mouse taint is not Brettanomyces. I had of course noticed that it arises only on the finish, but I had just assumed that it was a different type of Brett. 1. Acceptable very subtle mousiness = one mouse e.g. Simon mentions that Radikon can show mouse in its youth, but this goes away with time. Radikon is one of my all-time favourite producers (top 5), so this little mouse is very welcome. It's difficult to quantify, especially given how some people are unable to detect it. The mind boggles. It's like I've only just learnt that some people are colourblind. Or that some people taste coriander differently to others. I love natural wine. I find it fascinating, alive and wonderful, and think it's the only way you can make 100% purely terroir-driven wine. Of course non-natural winemakers also create beautiful wines, but I feel it can never reach 100% of its terroir-capacity. Definition-wise, what is natural wine? Can it include new oak? I think it can... That's another debate. What do I think about the mice? I think if they're very subtle and not too squeaky, they are allowed a very small part in the play. Perhaps a distant cousin of the main act. When evident, or lingering, the mice should be booted off the stage. After all, natural winemaking is all about terroir. Not about mice. Natural winemaking is about striving to create the best that the soil can be, through a wine. Soil and mice aren't related. 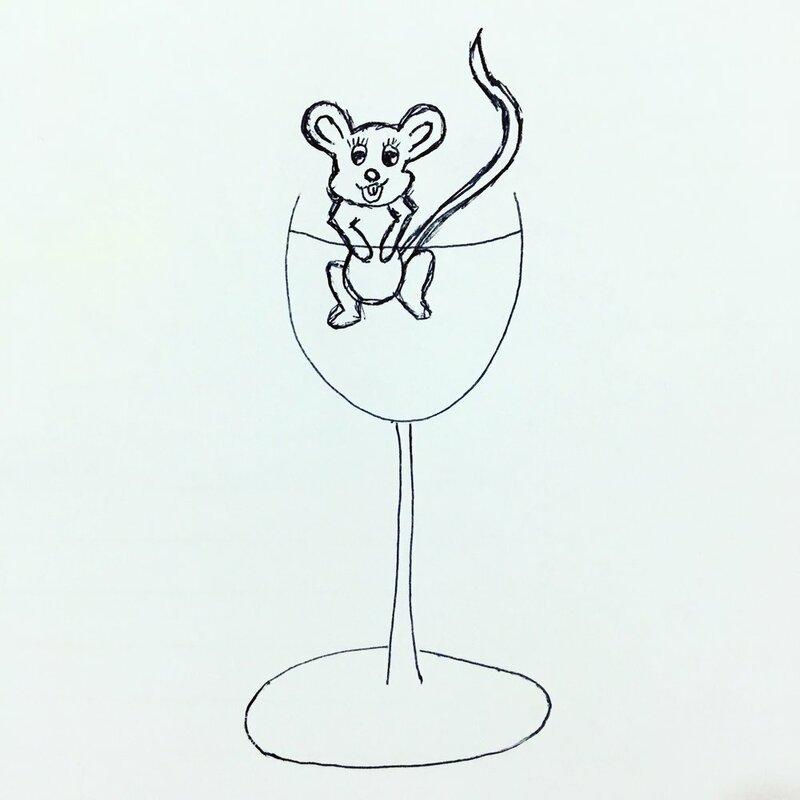 I understand it can be hard to make the wine without the mouse, but if there's two mice one year, maybe it will be one mouse the next, and then perhaps one day, no mice. Hey UK wine trade, Happy Three Years. Here’s what you’ve taught me. As I sit on the plane, on the first leg of the journey back from Canada where I have just spent five fascinating days exploring the wine region of British Columbia, I find myself reminiscing on my four-year anniversary with the wine industry, and my three-year anniversary (1105 days to be precise) with the UK wine trade. It’s been a brilliant and life-altering few years and, to start by quoting Andrew Jefford, “What a joy it is to possess a palate: to be able to smell and to taste the world. This is akin to the joy of having legs: to be able to walk and run through the world. In other words, it’s a gift the young take for granted – but both palate and legs need wise use and training to stay in shape, and to restrict the use of both prematurely, via excess or neglect, is a tragedy." I feel very fortunate to have advanced into a career that I not simply enjoy, but which consumes my thoughts consistently on a daily basis until I go to sleep at night and wake up in the morning. Looking back on August 2014, when a 23-year-old version of myself sat down at her first London desk to learn about the world of wine through newspapers and magazines, straight out of university, seems a lifetime ago. Reading magazine and newspaper columns and feature pieces through wine PR every day, has taught me what I know today; and I thank the wine journalists out there for that; you are all brilliant. Spending time with those involved in the London on-trade has sparked my obsession with wine lists; which has in turn taught me endlessly about other wines and portfolios; I thank all the trade representatives and sommeliers for that; you are equally fantastic. I am lucky to be able to surround myself daily with people of such vast knowledge and enthusiasm. A conversation in May last year saw me extend my career from PR and writing on my own website, to contributing to the UK on-trade magazine, www.the-buyer.net, which has since become a home for many of my vinous musings. I remember clearly being anxious about my first piece; suddenly there was a platform for my thoughts; previously my writings had been predominantly for myself. This leads me to the first thing I love about the wine trade. Everybody I have come across has time for me. Why? Perhaps because our world of vinous activity is so subjective: we enjoy being challenged and faced with other thought processes and stances, no matter of what age group or background. No matter our age or experience, the palate has a voice of its own, which deserves the ears of others. We are our own teachers; the more wines of diverse styles we approach, the more we learn and develop and the more conversations we spark. I learn from a group of, for lack of a better phrase, “wine people,” who have become my close friends. Some of them have spent decades in the trade, and all of them treat me with respect and consider my thoughts with an open mind. I’ll always remember to grasp onto this mutual help as I grow, and to equally welcome others that are new to the trade. I have met wonderful people around the world, most recently in Sonoma and British Columbia, and I look forward to building more friendships over the years. The “wine people” and I often engage in blind tastings. I LOVE them. There is nothing more thrilling than sitting down to assess a glass without knowing what’s in there. Mimi, Fifi and Glouglou, by Michel Tolmer, fabulously translated by Doug Wregg of Les Caves de Pyrene, is your nail-on-the-head accurate light-hearted cartoon guide to the joys and frustrations of blind tasting. I've lost count of the amount of times I have laughed with the cartoon characters. There are challenges. From an outsider’s perspective, it’s the dream job, and from the insider’s perspective, yes, it is still the dream job. There are tough sides: tasting all day with the ensuing toothache from acid-driven whites or sparkling wines, having a frustrating off-day when your palate does not want to have a conservation with your brain, running around frantically with boxes of wine and spittoons (trying not to spill them) whilst forgetting to eat breakfast or lunch, travelling multiple times in a month sometimes, often with weird routes, and going out a lot, sometimes many evenings on the trot. Timings, particularly for sommeliers, the late nights, the debates over multiple bottles until the early hours, all pose their own issues. We must be mindful, watchful and look after one another and ensure addiction does not develop, as Forbes wine writer Cathy Huyghe discusses in her article here. The aforementioned challenges have taught me to look after myself through exercise, and have taught me the wondrous simplicity of the simple basics: sleep, healthy eating, water and taking a few breaks. All of these were rather neglected at university, but have become staple basics to my adult routine. The hectic schedule has also taught me that no matter how much I want to, I cannot do everything. A friend recently asked me, “How do you do it all? The 9-6 job and all the writing?” I replied, “I love it so I will always find time for it. But even though it may seem as though I do, I can’t do it all. There will always be more to do, there will always be another article I want to write.” It propels me forward. I am becoming better at travelling; travelling lightly and uncomplicating my life is of utmost importance. Travelling lightly is equally of importance so I can stuff my suitcase with wine. Once again, water, sleep and a run if possible are necessities. As Jamie Goode wrote on Facebook, “Just boarding for Toronto. These days a 7 h flight feels like short haul ‬- 5 h time difference is jetlag for cowards” Haha. I think you get used to it. I’m getting there. In your face, jet lag. So to finish this train of thought, wine is not a career for the faint hearted, or for the half interested. To succeed, you must be smitten. If you love the industry, it will love you back. Three years is a comparatively short amount of time. I’m excited for what the future holds. My diploma starts in a few weeks, and I’ve made the decision to go down the MW route one day. I’ll report back in three years’ time, on our six-year anniversary. Hopefully I’ll be halfway (?) to MW by then. I headed to Noble Rot recently and was very kindly presented with this epic wine. Anybody who knows me knows my obsession with Gamay, and this wine deserves a post all of its own. Standing for Roberts, Parr, Myers (Nathan Roberts and Duncan Arnot Meyers of Arnot Roberts, and Rajat Parr of Sandhi Wines and Domaine de la Côte), the wine was conceived in 2010, with its first vintage in 2011. The idea was to create a world class Gamay from California’s granitic soils, which are similar in composition to the soils of Gamay’s home: Beaujolais. With the help of Steve Edmunds, this group of brilliantly talented winemakers were able to source the only two vineyards in California planted with Gamay Noir (which previously has been confused with Valdigue (which was exported as “Gamay” but is not the same whatsoever). Both vineyards are in California’s El Dorado, in the Sierra Foothills. The soils from Barsotti Vineyard are granitic, and Witter’s Vineyard is on decomposing granite and volcanic clay-loam. The result: they’ve nailed it. (Picture of vineyard from RPM’s website). The same grape. Three main names. Three names that couldn’t be much more different from one another. Aside from these three names, it has approximately 50 other synonyms. Sigh. Such is vinous life. For the ampelographers out there, it is the grandparent to Carmenere. Aside from the problematic naming, I’ve rather fallen in love with this little-known variety. I work with Plaimont Producteurs, who vinify Pinenc and use it in many of their brilliant SW blends. They have a phenomenal pre-phylloxera vineyard where they have some examples of pre-phy Pinenc vines. I was lucky enough to try some of their experimental microvinifications of the grape last year. The grape is lifted and fresh, showing red fruit and floral characteristics and works excellently blended with its fellow Tannat, Cabernet Sauvignon and Cabernet Franc. It is used as part of the blend in their striking and memorable top cuvee, Le Faîte, together with Tannat and Cabernet Sauvignon. The blend changes every year, and is a unique blending of the best expressions of Saint Mont terroir. There is an iconic blending day for it, which welcomes well-known journalists and sommeliers; this year being Olly Smith and Serge Dubs (of l’Auberge de l’Ill) to all come together and decide which blend shall become the final wine. It’s very special, small-production, and due to being lesser-known it’s incredibly affordable too. NOTES ON 2012: Lovely intense red berry nose of black raspberries, blackcurrants and blackberries, with a little cocoa nib. It is intensely fresh, and will age for decades. Lifted hints of spice and liquorice on the finish. The UK agent for the trade is Corney and Barrow. Consumers can buy it through Portland for £21.95. The white cuvee is available through Adnams – a blend of Petit Courbu, Petit Manseng and Gros Manseng. Three weeks apart, I came across two examples of this grape on two equally brilliant wine lists. TASTED AT ELLORY, DOMAINE LAURENS CUVEE PIERRES ROUGES 2015. When hailing from Marcillac, the grape is known as Mansois. This one comes from Domaine Laurens, and the vineyard is very steep and terraced. Deep eroded sandstone, rich in iron oxide. NOTES: What a wine. So juicy. Fresh figs, blackberries, blueberries and a little bramble on the finish. Lean, stony, mineral core with a little grip and tons of freshness. It’s crunchy. A wine with energy. TASTED AT BRILLIANT CORNERS, DOMAINE DU CROS CUVEE LO SANG DEL PAIS 2015. Here we are with Domaine du Cros, again on steep vineyards with eroded limestone, with the signature “rougier”/iron oxide soils. NOTES: Bright, lively red fruit: ripe redcurrants, frozen raspberries and some wild strawberry. Some liquorice on the finish and a distinct freshness and a certain graphite quality from its rougiers soil. Aside from these, I haven’t many other examples of the grape, so please reach out to me if you do…! There is so much Pinot out there, and there is an awful lot of an average quality: good, but nothing special. Not this one. This one is pretty epic. The wine gets its name from a long period of skin contact (100 days! ), and a bone-dry finish. It is Pinot Noir from the Gower vineyard in Lenswood, Adelaide Hills, Australia. The soils are loam made up of stirling sandstone over deep clay. Unfiltered and unfined, aged in 10% new and 90% neutral French oak. The fruit is 100% destemmed and sorted. Barrels filled roughly ¾ to allow space for CO2 to blanket the ferment. Only 500 cases made. For the wine geeks, clones used are Dijon 114, Dijon 115, MV6, Dijon 777. Unlike any other Pinot I’ve had. On the nose, there are red fruits, particularly frozen fruit – frozen crunchy raspberries and cherries, with some undergrowth, as well as a little pepper. Very juicy and with a bigger body than normal for a Pinot, this has mouth-filling fruit and that animal-like bacon fat side. It has lovely structure and smooth, well-built tannins, with a long finish. Despite the skin contact and structured tannins, it is really quaffable. BK Wines was founded in 2007 by Brendon and Kirstyn Keys. Their goal is “to create fabulous art. Beautiful, unique, sensuous, deceptively minimalist, envelope-pushing art.” And with this wine, they’ve definitely succeeded. After learning from winemakers in NZ, Argentina and California, they decided to settle in the Adelaide Hills. The winery is surrounded by bush land and vines. As a winemaker, Brendon seeks artistic expression and high quality fruit. He uses a minimalist approach in his winemaking. Enjoyed at the wonderful wine bar UNWINED, in Tooting. 2016 was a great year for wine, if not the best for politics. You can read my short round-up and top six picks (really tough task) of the year here on The Buyer. Highlights of the year included exceptional tastings (in particular AoA, Barullo, the Beaujolais celebrations on Nouveau day at Noble Rot – with winemakers Andrew Nielsen of Le Grappin, Jean-Louis Dutraive and Julien and Antoine Sunier), and meeting brilliant winemakers such as Bryan MacRobert and Albert Ahrens with Red Squirrel, and the ’76 Paris rematch and meeting Elena Pantaleoni at Sager + Wilde). Abroad, highlights included a trip to Beaujolais, where I was fortunate enough to taste some fascinating old vintages from various producers (including a stunning ’76 from Château du Moulin-à-Vent). This cemented Gamay’s real capacity for ageing in my mind. I also visited small artisan producers such as Lapalu, the Suniers, JP Brun, F. Vergers, A. Kuhnel, the Thillardons and more, all producing epic Gamay. It’s been the YEAR FOR GAMAY, for me. With Plaimont Producteurs, tasting microvinifications of reintroduced (from a pre-phylloxera plot) ancient and forgotten varietals in Saint Mont was another highlight. A trip to Masi, in Valpolicella, saw me learn about drying lofts (appassimento) and pergola vines. 1 – More Gamay: Of course from Beaujolais, but from further afield as well. I want to get to grips with Gamay’s expression in the Loire. I’ll be looking forward to tasting more Canadian examples too. 2 – Italy. All over: The country has a wealth of indigenous varietals of huge interest to me. I think we’ll see more Lambrusco too, as well as other red sparkling examples. Franciacorta and Trento will enjoy some more noise I think. Tannico stock brilliant examples of all of these. 3 – Croatia: Again – fascinating indigenous varietals to explore, and wonderful styles. Lots of amphora and skin contact too. Borgonja is very interesting. Check out Croatian Fine Wines for some of these. 4 – Greece: again – all about the indigenous varietals. I love the saline quality that Assyrtiko can take on. A recent tasting with Southern Wine Roads was fascinating, – I will be writing it up soon for The Buyer. 5 – Aligoté: A varietal I should have tasted more of. With wines like Love and Pif out there, there is a lot to be explored. 6 – Kazakhstan: I saw some impressive wines from Kazakhstan at the London Wine Fair last year. Hoping to see more of these this year. 7 – Garnacha! : In lighter, unoaked styles. Possibly also more minimal intervention Rioja? I’d like to see that. 8 – Vermentino, and Rolle: (the same, French tho). In 2 styles – the more reductive and very fresh style, as well as the richer, round style. The Rolle from Le Grand Cros falls into the latter and is really stunning. 9 – English reds: I absolutely love Chapel Down’s Union Red and think we have a huge potential in this country for light, elegant reds. 10 – ….. More small production Nouveau within the trade? I’d like to see some Nouveau from other regions (and even countries?) because they’re very interesting wines, that give some insight into the vintage. As most of you will know, I’m from Denmark, and like the rest of Scandinavia we have a million amazing old fashioned Christmas traditions. One of these is gløgg; a hot drink traditionally made from red wine often with the addition of brandy, vodka or akvavit (clearly we have a high alcohol tolerance...?) My dad always says that back in the 80s in Copenhagen at Christmas time the gløgg would have so much akvavit that you'd be rolling to the next bar after the second. This Christmas, my sister decided to make hvid gløgg (the white version). Fairly simple to make and with a large vat you can serve up to 20 people or more. 1) Put all the ingredients in a saucepan and heat it. 2) When hot, switch the heat off and let it infuse for 30 minutes and gently reheat it for serving. Beaujolais Nouveau: A tradition that’s been going since the 70s, where people would race with the “baby wine” of Beaujolais to Paris, and then to London, and in later years to Asia, America, and so on. It happens on the third Thursday of November, with chants around the world of Le Beaujolais nouveau est arrivé!!! The wine is a vin de primeur. It was originally created to assess how the vintage is going, as a way of winemakers to communicate with one another and have a first glimpse of the latest (in this case 2016) vintage. Personally, I think it’s fascinating, not just for Gamay/Beaujolais, but for other regions too. I once tried a baby Mâcon, which was wonderful – young and crazy and tasting of Haribo eggs, but nonetheless a solid, good baby wine-in-the-making. Unfortunately, it resulted in a lot of poorly produced, weak, off-balance Beaujolais Nouveau that was produced to keep up with the marketing. This led to the Beaujolais name becoming somewhat tainted. It also led to consumers thinking that this was Beaujolais: this half, weak, baby wine. They thought the toddler was in fact the adult. This is frustrating, and a huge shame, because Beaujolais is capable of creating really fine wine, that can compete against the Pinots of the world (Gamay is after all, the genetic child of Pinot Noir). The crus have impeccable capacity for ageing, and the wines produce a very delicate, earthy, wild-strawberry-like wine with age. They are, in my opinion, some of the best wines for mirroring their terroir: Gamay is a delicate, ethereal varietal whose aromas really reflect where it comes from. Furthermore, Beaujolais has the most fascinating array of terroirs. SIGALES have recently carried out a study of the soils of Beaujolais, using drill trenches and infra-red. This has resulted in the amazing characterisation of soils. And really – these have an evident effect on the wines: wines from granite have a very different taste profile from those from alluvial soils, schist, or manganese-heavy soils. How this happens, we don’t know, but I am adamant that it does. Over the past few years, there has been incredible advances in Beaujolais. We have of course always had the fabulous Gang Of Four (Lapierre, Foillard, Breton and Thévenet), but in recent years, small young artisan producers are popping out left right and centre, for example Damien Coquelet, Mee Godard, Fréderic Berne from Château des Vergers, Brice Laffond and Jean-Jacques Parinet of Château du Moulin-à-Vent, the Thillardon brothers, Mathieu Melinand, the Sunier brothers are just some that spring to mind, there are many many more. These are highly talented producers, making very expressive wines from specific plots, that truly express a sense of origin. There’s a focus on natural production: indigenous yeasts, no fining/filtering etc, that means you pretty much get the precise expression of the vineyard into your glass. What does this mean for Beaujolais Nouveau? The Bojo Nouveau wines from LAPIERRE and from REMI DUFAITRE will be available to taste at Soif, Terroirs and Toasted. NB; In additon, these restaurants will be serving a Muscadet Nouveau from Landeron, and “Octobre”, a nouveau from Roussillon (domaine Foulards Rouges). Say whaaaat? I’ll obv be trying these too. Furthermore, the wonderfully talented Andrew Nielsen from LE GRAPPIN has created a single vineyard plot of #BOJONUVO. This will be available in Ben’s House, Bistro Union, Brunswick House, Clipstone, Galvin Bistrot de Luxe, Galvin Hop, Grain Store, Noble Rot (Fête du Beaujolais, with Pierre Koffman overseeing the menu and Andrew Nielsen in attendance along with Jean-Louis Dutraive and Julien Sunier), the Winemakers Club, 161 Food+Drink, and Ruby’s for their Genuwine dance party. Made from (declassified) old vine Côte-de-Brouilly grapes and placed into an IBC (International Beverage Container – a 1000L drum) under cover of CO2 for sixteen days untouched under pressure of its own CO2 produced naturally by fermentation. On the 16th day of cuvaison, the top was cut open, and the grapes were crushed by foot. The juice was run off to be fermented separately from the pressings. Unfined, unfiltered, no added yeasts or any additions of any kind. No SO2. Kegged by gravity. Inspired both by old-school closed top carbonic fermentations from the Beaujolais and Vino Di Anna’s Palmento made from the free run of foot crushed grapes. The wine comes direct from the keg via the on-tap project started last year by OW LOEB – who now works with over 30 top London restaurants delivering quality wine by the glass fresh from the winery. This is in order to protect freshness, and be environmentally-freindly. It arrives in London TODAY, fresh from the cuve in the keg! Nielsen is well-renowned for his passion for the environment – for example he doesn’t use capsules on his fine wines, and he creates “bagnums” and kegs for his vins de soif. Rolle. AKA Vermentino, but grown in the South of France. It’s one of my current grape crushes and writing this has made me decide to go out and seek some more. In white wines, one of the main things I look for is a balanced acidity, and in particular, mouthfeel. Mouthfeel is something that I think lacks in a lot of white wines, and equally finding a white without a piercing acidity can be tricky. (Saying this, I am biased as my taste tends to lean towards wines with a lower acidity.) In this case we have a wine that naturally has a high acidity and this wine has extraordinary balance. Prominant honeysuckle and lemon on the nose, with a lovely soft palate of white peach and apricot. Fantastically long finish with slight almond notes – lingering on the palate. Julian Faulkner, winemaker at Le Grand Cros, feels strongly that there is a place for Rolle in Provence, and I agree. A market that is dominated by rosé also produces this lovely varietal that I feel is often forgotten about. It is commonly used in rosé blends, but now we are seeing a few producers making it as 100% whites. I just hope we will start to see more. Rolle has a unique flavour spectrum in the climate of Provence. While producing its signature citrus and floral, fresh aromatics it also produces stone fruit flavours such as peach and apricot, and in some cases some exotic notes. What really draws me to this wine in particular is its soft palate and lovely mouthfeel – it fills the mouth and has a fantastically long finish. Perhaps one of the longest finishes I’ve ever experienced from an unoaked white. I would describe this mouthfeel as a lighter, more lifted style of Viognier, while maintaining a slight “zing” you get from other SW varietals such as Sauvignon Blanc and Roussanne. Each parcel is vinified separately; short skin contact at 15°C; grapes were pressed with early separation of pressed must; tight cold static must settling; temperature control of fermentation at 16-17°C; racking and blockage of malolactic fermentation. I have a love affair with Chenin Blanc, particularly hailing from South Africa, and I just love this. Wonderfully crafted, seriously impressive wine. With a wine label like this one, I half expected something pretty funky – perhaps on the orange scale/very tannic, or unfiltered and mega cloudy. Not to say I don’t like these wines – I’m one of their biggest advocates – but this wine isn’t about that. It’s extremely complex, and a serious wine, which arguably has something old school about its style. Saying that, it is extremely creative/new wave in its winemaking – I can’t say I’ve ever come across a wine made in this way before. Gorgeous, soft orange peel on the nose, with apricot, peach and almond/hazelnut notes appearing on the palate with a little nutmeg present too. It’s deliciously rich, but balanced: weighty, but not overly heavy. It has a lovely saline minerality on the finish – I would guess from the flor. Although very ripe, it has lovely fresh acidity running through which leads me to think this will definitely cellar well. It is a wholebunch wine, pressed in a basket press. From Chenin Blanc, it’s aged 30% in a Nomblot egg and 70% tank fermented. Indigenous yeasts, with just a tiny amount of sulphur. A non-vintage blend (meaning it doesn’t come from one particular year), this wine has been selected over four vintages from 2013-16. Part is aged under flor, and some is madeirised ‘sun wine’. It’s a complex little beast. A Swartland producer, made by Ryan Mostert and partner Samantha Suddons. Yet another one that shows just how good this region combined with innovation can be. They produce Chenin & Cinsault, naturally fermented in 670l Nomblot concrete eggs. Smiley NVs: Chenin & Red Blend. Minimal intervention wines to optimally express a sense of terroir. Available to the trade through Les Caves de Pyrene. Nomadic young winemaker, Patrick Sullivan, makes Aussie wine inspired by “emotion, a moment in time and a sense of place.” And he’s pretty good at doing it. This is seriously creative winemaking, and it works. Mega natural (and not to everyone’s taste – but definitely to mine). It’s really juicy, rather like alcoholic nectar. Unfiltered so very cloudy; in fact it looks a little like an apple/rhubarb juice in appearance too. Low sulphur with skin contact. From a blend of Moscato, Pinot Noir, Sauvignon Blanc, Semillon and Malbec (wow). It’s a blend of wines that weren’t needed in other cuvées. All of this would mean you might expect it to be a bit tough, or tannic, or simply a one-glass type of a wine. BUT NO. Alas, it’s actually very easy to drink and very moreish. Strawberries, blackcurrants and blossom notes. Very fresh and rich on the palate, with great mouthfeel and texture. A real gluggable wine. I enjoyed it at SOIF, which is an epic natural wine and French food restaurant in Battersea. I would thoroughly recommend it to anyone – it’s one of my favourite places in London to eat. Available to the trade through Caves de Pyrene. It’s no secret that I’m a fan of orange wine (the good stuff tho). This is a brilliantly made one. The tannins are very well integrated, and aromas are delicate. It’s vinified in amphorae, as with many other orange wines, and this particular wine really is very reminiscent of sunny Sicily. NB: why is it orange? Orange wine is orange due to its prolonged time spent with the grape skins (in this case – a while seven months in amphora with its skins). In a way, it is white wine produced in the style of making red wine. Herby, spiced, orange-peel nose with delicate floral aromas. Textured and supple, the palate is fresh, spicy and slightly saline on the finish. Seven months ageing in amphorae (large terracotta pots, that mean the wine avoids oak flavour and can breathe more). Azienda Agricola COS was founded by Giambattista (Titta) Cilia, Giusto Occhipinti and Cirino (Rino) Strano – hence the acronym COS. Three friends who wanted to recreate the work of their ancestors. They became the younest winemakers in Italy in 1980 when they bought the winery. Their first harvest comprised of just 1470 bottles. Rino went into medicine and so sold his shares to his sister, Giuseppina. They bought further vineyards. Today, it is just Titta and Giusto. The estate became biodynamic, to express terroir, and the true craft of winemaking. PITHOS was born in 2000, when the duo began working with the amphorae. That’s not at all to say I don’t love Chardonnay from elsewhere – it’s one of my absolute favourite varietals. Personally, I’m a huge fan of small, independent producers who create interesting and terroir expressive wine. In particular I adore the Deux Terres from Paulatim (natural Chard from the Ardeche) and A Moment of Silence from BlankBottle (Chardonnay blend with Chenin Blanc and Viognier). These are different wines though – they’re gorgeous expressions of the grape, but they’re wines to be viewed in terms of their own unique styles and terroirs. When it comes to a real “holy cow” wine – one that can rival a Montrachet, and one that can lie down for many many years, this is one of the first outside of Burgundy that’s really blown my socks off. Theo, Alex and Marcel Giesen began the winery back in the 80s, after leaving their native Germany. It’s one of the big producers of Sauvignon as we know it today. This isn’t what I’m going to talk about here. They have recently begun to make their single vineyard series. I tasted The Fuder Chardonnay in The New Zealand Wine Cellar. It’s labelled a “Clayvin”. This is its vineyard. I like this. I’m all about terroir and earth and soil, and to see them put this on their label makes me happy. It’s direct, clear message to the consumer that the reason that this wine is so good is because of its soil. The Clayvin vineyard is a high density, low yielding site that lies on the foothills of the Southern Valleys in Marlborough. Silt loam with clay. The vines are 19 years old, and organically farmed. “The Fuder” – the range of whites are so-labelled because of a return to Germany by Marcel Giesen to visit a friend’s winery, where he rediscovered the 1000 litre barrels. Originally, they were used in the Mosel – large size reduces surface to wine area – this gives the wines structure, but expresses minimal oak and instead lets the terroir speak. Hand harvested, whole bunch pressed, settles and transferred to new 1000L Fuder German Oak barrels. Wild yeast starter creating a warm natural ferment, rested on yeast lees for 11 months prior to racking, wine underwent 100% malolatic fermentation. I debate with myself sometimes that malo can hide the terroir, however, I feel it’s fantastic here. To have a Chardonnay with such superb terroir, and such superb fruit, the malo turns it into a real gem, and this definitely is that. Giesen says its ageing potential is four years, but I think it’s going to be a lot more than that. Texturally, it’s soft and gentle on the palate, however in terms of fruit it’s really a bit of a rockstar. Big peach and pear aromas with wonderful almond and hazelnut aromas. The oak gives it that lovely nuttiness – but by no means is it harsh. The 1000L barrel creates something special here – a gentle, moreish, fat (but not too fat) Chardonnay in a style that isn’t “in your face”. It’s wonderful. Yesterday, I gathered my notebook, pen and nose and headed down to the Tobacco Dock in Wapping to the Real Wine Fair. The Real Wine Fair is a celebration of all things organic, biodynamic and natural, within the world of wine. Suffice to say I wasn’t quite prepared for what was ahead. Two huge rooms of some of the most interesting producers and wines I’ve ever encountered. Two hours was nowhere near enough. One wine was a combination of 417 grape varieties, something I’ll probably never get to try again. Organic, natural and biodynamic wines are no longer a niche thing, or the reserve of hipsters. They’re (finally) garnering more attention and so they should. Yes, some of them might be on the weird and wacky side, but isn’t that what wine is about too? While we may all retain love for classic Bordeaux, it’s incredible to taste wines from farflung places made in unique and sometimes ancient methods, or on the other hand, innovative and new methods that haven’t been tried before. I’ll be looking in-depth into more of the producers too, but for now I’m going to concentrate on Ovum Wines, all the way from Oregon. Ovum stays true to the tradition of old world wine production, focusing on the neutral barrel (or Nomblot cement eggs) In this sense Ovum is “an homage to the past”. Their niche is discovering the terroir of the Pacific Northwest, uncovering unique terroirs and the resulting expression of place through the medium of wine. Their wines all aim to show a wild aspect, whether from the native ferments used in winemaking, or discinct characteristics that come from the remote forests on the California-Oregon border. Their labels seek to give an indication of what’s inside the bottle. I had the chance to really experience this with the comparison of two Gewurztraminer wines from the same vineyard both named with Nina Simone lyrics, but one from alluvial clay, called “Do I Move You?” and the other from serpentine clay, called “Into the Dark”, which John explained to me is a very unique gold/green clay that comes from the oceanic crust. The terroir used to be a gold mine in the 1800s so its rich in magnesium. The first was a smooth gentle delicious Gewurtz with green apple and floral “joyful” notes, as I would describe. The one from serpentine clay showed a deeper more serious side of earthiness, an entirely different palate to what the first showed. This can only come from the terroir, so to any wine critics out there harping anti-terroir theories, try these and say that this isn’t to do with the soil and I’ll eat my hat. Wonderfully gentle, soft palate of green apples and blossom flowers. Serious palate with earthy, forest notes unusual for a Gewurz, still with the blossom but a slightly riper side to it. Grown in Basalt. Lovely ripeness and zingy texture with a low pH of under 3. Sea breeze notes with fresh white flower notes, combined with a honeyed finish. Bright acid with a natural sweet side. Green apples combined with ripe peach notes, again with slightly savoury notes. Neverending finish. Bright freshness: I could drink this day in day out. Lime combined with minerality, and such a vitality. The classic white blossom shines through here, but with that wet mineral rock characteristic so unique here. Thanks for making these John!! However, better late than never…! As it turned out, I picked the perfect evening to head there as Wells Guthrie, winemaker of Copain Wines in Sonoma County, California, would be present. The bar itself is small, cosy, dimly lit and fitting to East London with its bare wood and stripped walls. Sager + Wilde works in a very unique way with a sole purpose to please the wine enthusiast. In a dog eat dog world, it is increasingly rare nowadays to find somewhere that specifically caters (and cares) for the consumer. A flat mark up rate of £20 per bottle is amazing to find in London, and made me extremely thankful. When it’s payday, I’m coming back to try some of the finer wines that I no doubt would not be able to taste for those prices elsewhere. It is clear this is a bar born from love and passion, evident in the owners’ exuberance. Their wine list changes daily, with a large selection of wines available by the glass (yay). We chose the Syrah ‘Tous Ensemble’ 2012 and the Pinot Noir “Tous Ensemble” 2012, both from Mendocino County. Syrah ‘Tous Ensemble’ 2012: Blackberries and black cherry aromas with pepper, with underlying hints of spice. In the mouth, the tannins are already developing well, with a slight meaty presence. Pinot Noir ‘Tous Ensemble’ 2012: Wonderfully earthy nose with hints of moss , with cherry and some ripe raspberry in there too. In the mouth, round , supple and moreish. Wells Guthrie came and spoke to us personally, first introducing himself, explaining his career thus far in winemaking. He originally started his love affair with wine with Syrah, and moved to the Northern Rhone working with Chapoutier. he has also spent time in Burgundy with Frédéric Mugnier (this revelation left me painfully jealous – there’s really no better way to learn about Pinot). This French background shines strongly through in his wines, and I must admit in a blind tasting, the Pinot Noir could have fooled me for a Burgundy (perhaps a Beaune? They had similar qualities). Wells emphasised that he admires the European style, and shies strongly away from the often very bold Californian new oak style. He stressed that he does not use new oak, indeed French barrels of approximately ten years old instead. This really allows the varietals to shine through and leaves them without the overly present and often overpowering Californian oak style. The Syrah is 15% whole bunch, a good percentage, adding the right amount of tannin. The Pinot Noir is 100% only grapes, no stems, which Wells said was important to him as he is a Pinot purist. I strongly agreed! Both wines demonstrate an impeccable balance, and I would be very excited to try them again in a few years’ time. The Syrah is produced in large 600l barrels, whereas the Pinot is in standard, which again demonstrated to me exactly why the wine is the way it is. The Syrah needs this larger barrel to develop as well as it has, and this shone through evidently in the wine in front of us. The small production and low yields of both are vital in recognising just how excellent the quality is. On the other hand, be what it may, it’s a great reason to celebrate love and serves as a reminder to take some special time together and celebrate a relationship. For me and I’m sure the majority of the population, that involves food and wine. And what better than a wine that’s called Saint-Amour, literally St. Love? It comes from Beaujolais, a wine region in France that is famous for its grape varietal Gamay. The region is formed of the Beaujolais AOC appellation, Beaujolais-Villages AOC, and ten “Crus” – wines made from villages that have certified “Cru” status. There are ten of these. Beaujolais is one of the only rench regions left to still provide an excellent quality/price ratio. These cru wines will reflect clearly the terroir that they come from, for example the shallow granite soils of Chiroubles tends to produce lighter, fruit-forward wines, whereas the schist, slate, iron oxide and manganese “blue stone soils” of Morgon Côte de Py tends to produce bolder and punchier wines that tend to be darker in colour. I could drone on about these in great depth but for now that’s what you need to know. Saint-Amour. The romantic Cru. It is the most Northerly Cru of the ten, bordering the Mâcon region of Burgundy. It produces lively, particularly refined and balanced wines. It is particularly famous for showing lively red fruit. For example it will show aromas of kirsch and spices. The soils are siliceous-clay. I have chosen one wine in particular that I love. Aside from this one, you can get Saint-Amour from Virgin Wines + Kwoff + Tanners + Alpine Wines. In 2007, Domaine Joseph Burrier acquired the one hectare vineyard of the ‘Côte de Besset’ climat. The plot faces east on a granitic scree slope next to the village of Saint Véran, on the wide, steep slope of Mount Besset (the first steep hill of the Beaujolais region). Light, crumbly lava soils combined with compact, hard granite and quartz stones. The soils are generally silty, sandy and shallow, naturally limiting the yields. The vines have an average age of 40 years old and are managed in an environmentally friendly manner to promote microbial life in the soils. They are 100% hand harvested and yield control is strict. Following hand harvest the grapes are hand sorted at the Beauregard winery. Vinification is traditional and aimed at expressing terroir. After partial destemming the grapes are macerated for six to nine days with punch-downs and pump-overs. The end of the fermentation process and the ageing is carried out in “pièces” (228l oak barrels) for seven to ten months. The wine will evolve for at least three to eight years. Velvety, light and with strawberry notes, slight cinnamon and particular eathy notes. This time across the pond from Australia. I had the pleasure of meeting David Bowley from VINTELOPER at the ADT (Australia Day tasting) on Tuesday. I was blown away. I always make a beeline for the guys at Red Squirrel when I have the chance, and I wasn’t disappointed. To say I wasn’t disappointed is a huge understatement. I have, for a while now, been seeking “artisan” wines. Wines of small production, where care, love and innovation goes into every bottle. These artisanal wines are the future of wine and its development. Wine to me has always been ethereal, something non-temporal. They’re exciting, different, and in many cases exceptional. I know my favourite classic wines: so instead of revisiting them time and time again, why not explore, and discover? I’ll never forget the first time I had Montrachet, but for me wine is about sensory exploration and trying new things. David Bowley, winemaker, trained in both Australia and France (more specifically, in my beloved Burgundy – in Nuits St Georges). In 2008 he took the helm of Vinteloper. Aromatics and precision has become his signature style. Riesling is my “obsession du jour,” as I’m sure my colleagues know as I’m harping on about it. This is a fresh, elegant style with lovely fresh blossom, pollen and citrus notes. It’s tight in a good way – really zingy minerality. Long [8 week], cool, controlled fermentation. Temperature held at 11-14C. 100% stainless steel. Yay. Another Riesling. This time – wow. This is different. Still the blossom, but where the other one seems cool, this seems warm. It has honey, nutmeg, spices. That little bit of warming delicious petrol that a bit of age brings. Some label this as a natural wine. What this means is that the grapes are processed without modern mechanical input. No additions. Wild yeast fermented in old french oak barrels. No temperature control applied. Post fermentation French barrels are filled & sealed. Yeast lees are stirred occasionally (battonage). The wine spends 12 months sitting on these lees in barrel. Pinot Noir. My favourite red grape. This does it justice. Fine and delicate and everything a New World Pinot should be but with the addition of those wonderful Old World notes such as undergrowth and woodiness. Red berries, plums and delicate spices. Single vineyard. Planted 1990. NNE facing. N/S orientation. Clone D5V12. Elevation 440m. Pigeage (that’s stomping) by hand & foot (!) Wild yeast. 33% whole bunches. 11/12 in French oak. 33% new. Unfined and unfilterred. NB: ADELO (Latin) – Obscure, secretive, unknown. Touriga! From Aus? Portugal’s finest grape hops over into a blend. A really aromatic red. Earthy, violet, almost lavender-like notes. I wouldn’t have been able to guess what this was! All vinified separately, to allow for the best expression of varietals to create this unique blend. This wine isn’t about the varietals – it’s about the creation that they make. 100% wild yeast fermentation. 60% french oak, 40% american oak for 11 months. 89% field blend. (but if you want to know what they are, it’s made from Touriga Nacional 61.9%, Shiraz 27.1%, Grenache 5.5%, Pinot Noir 5.5%). Aromatics on aromatics on aromatics. Violets, cinammon, persimmon, cocoa. So fresh. Single Vineyard. 20 year old vines. Highly saline clay soil. Wild yeast. 21 days on skins. 50% French Oak. 50% American Oak. Meaty, gamey nose with dark juicy fruit. A real peppery bomb, just the way Aussie Shiraz should be – all the correct elements. 18 month oak maturation period followed by a further 6 months in bottle prior to release. Single Vineyard. Wild Yeast. Post fermentation maceration. 100% French Oak. 15% New. This is really special. To put it into perspective, this wine comes from only 8 rows of plants (60 plants). Leave the best till last, they say. Some wines please the soul. I don’t care if you think that sounds stupid – this one does. Gorgeous, ethereal velvety earthy Pinot colour. Woodsmoke, undergrowth, mossy cherry flavours that develop on the palate to express further bright fruit flavours of raspberries and even some kind of recurrant expression. I wish I could see this in 10 years’ time. Single Vineyard. Lenswood, Adelaide Hills. Planted 1986, Steep east facing slope. E/W row orientation. Clone D5V12. 550m elevation. Pigeage by hand & foot. Wild Yeast. Whole bunches. French Oak. 50% new. Go get them from Red Squirrel. However, that’s not to say that it shouldn’t be used. I’m in favour of the word’s usage but it’s just important that everyone remember what it actually means. So, the two combined, my perception of craft is a product that is made independently, by a small company, with traditional or innovative thought with as little mechanical intervention as possible. Small, indie producers are appearing more and more, and hoorah for that. It’s great to know that you’re consuming something that is the direct product of nurture and care. For these companies, their product is their pride and joy. This isn’t to say that big companies don’t care; of course they do, however they have the funds behind them to take part in huge experiments and have ultra high-tech wineries, which the little indie producers don’t. You can’t put the two in the same category. When a little independent company really gets something right, it’s so impressive. I discovered Birds and Bats company in Philglas & Swiggott, arguably my favourite independent wine merchant. It’s the brainchild of Leah de Felice Renton & Nick Jones. The company makes Wines of Momentary Destination. It is a pop-up winemaking collective, making one wine, in one place for one year only. Everything from the grape to final production is managed by their team. So far, WMD have made three wines: FUSE 2012 (from I.G.P. Côtes Catalanes in France), THE SPECTRE 2013 (from Krov + Kinheim, Mosel, Germany) and THE WILL TO LIVE 2014 (from Istria, Croatia). You can get The Will to Live 2014 from various little independents around London: in Market Row Wines in the Brixton Market, Hop, Burns + Black in Dulwich, Jones of Brockley and Bean & Hop in Earlsfield. You can drink it by the glass at The Manor in Clapham. I haven’t had the chance to try the WMD wines yet, but I did try the wine that is a collaboration between Birds & Bats & Ariousios. It’s a wine that’s bought, blended and labelled under Birds & Bats Wine Productions, but made by Ariousios. If this isn’t craft, then I don’t know what is. And it’s seriously good. Available in Philglas & Swiggott. It is a blend of three puncheon barrels from the Ariousios winery, IGP Chios, Chios Island, Greece. The Ariousios winery is a modern winery that is determined to restore the world renowned wine trade the island once had in ancient times. Hand harvested on the 25th and 30th of September from organically treated vineyard sites in Aglosia and Ambelitis (NW Chios). Average vine age of 10 years. Crushed and destemmed followed by a cold maceration. The wine was fermented with pure culture Saccharomyces cerevisae and pumped over twice daily. At dryness the wine was drained (not pressed) into French oak barrels. The wine was left to mature in wood for three years down in the cellar. Tasting note: Incredibly rich with black fruits notes of blackcurrants, cherries and nutmeg. Slight floral and herbaceous qualities. Savoury and moreish, showing woody forest-floor notes in the mouth. Founded in 1883, Viña Concha y Toro is Latin America’s leading producer, producing wine from 8,800 hectares. They produce a multitude of grape varieties from Chile and Argentina. It’s really likely that you’ve drunk one of their wines at some point: probably most notably their Casillero del Diablo, (see below). You can find these wines everywhere, and they’re of impeccable quality-price ratio. Matthew Jukes, wine critic, states that the Casillero del Diablo Cabernet Sauvignon Reserva 2013 is one of the the world’s finest value Cabernet Sauvignon. It’s pretty much impossible to disagree; it’s an outstanding quality for only £8. Marcelo Papa is the genius behind it all, and the wine I want to focus on isn’t Casillero, but from the Marques de Casa Concha range. The new vintage of Marques de Casa Concha Cabernet 2013 is now in Sainsbury’s. Marcelo Papa, winemaker, has been experimenting with larger oak casks and earlier picking over the past few years and this is the first vintage released that is testament to these experiments. His wines are moving away from the “blockbuster” style of the 90s and returning to an elegant style with lower alcohol that demonstrates the terroir of Puente Alto. Marcelo said he wanted to drink a wine that he himself would always choose to drink, and hence with these changes, we see a fresh and expressive wine. The little bit of extra money really goes a long way. In short, the way I would describe this – this means we have a fresh wine that has notes more focused on blackcurrants and fresh blackberries like the ones you can pick right off the bush, instead of the ones that have been sitting in a supermarket box and a bit squished. This is done through picking dates (see below). Here’s a visual that makes it all a bit clearer to understand: (from left – earlier picking – to right, later picking) The earlier the grape is picked, the fresher flavours it retains. How has Marcelo done this? Using different varietals is up to the winemaker and what he feels will make that specific vintage stand out. Different varietals give the wine specific characteristics: for example here the addition of Petit Verdot adds tannin, colour and a boost of flavour. It’s a great blending grape. The region/vineyard is up to the winemaker; which region has succeeded best during that vintage and hence stays true to the wine. Picking dates! = Marcelo is creating a whole wave of difference in winemaking. Later picking means more opulent fruit, but less acidity. Earlier picking gives you fruit forward notes but with a much fresher style. Barrels and casks used = in 2011, Marcelo got new 5000l casks from Italy. Chile naturally has a warmer climate than Bordeaux, so already gets sweetness from the climate, without the need for using lots of toasty oak. Hence, the use of these big botti mean that the resulting wine really demonstrates terroir with a much less oak-heavy presence. The final resulting wine? Delicious, and – (again) – fresh. Food pairing? A good steak, or a winter stew. Also goes well with strong game flavours or as your red for a cheeseboard. Cherry, cedar and blackberry notes with a smoky edge with a tar presence. Tight and focused with a deep concentration of flavours framed by firm tannins. In December, I came across a wine that is still on my mind at The Three Wine Men. White: In terms of grapes, Grüner Veltliner is the dominant varietal for white wines: a little bit like a slightly spicier/exotic Sauvignon. It also produces Welschriesling, which produces quality wines in the South, and as it is susceptible to botrytis, also excellent dessert wines. To make things complicated, Austria also produces some Pinot Gris and Pinot Blanc, but under the local names of Ruländer and Weißburgunder (yes – why can things never be easy…) It also makes a lot of high quality Riesling, and as we will come onto, Chardonnay. Red: The country also produces lots of lesser known varietals of its own such as Zweigelt (deep, soft tannins and bramble fruit aromas), Blaufränkisch Blauberger (hybrid of Portugieser and Blaufränkisch – intense colour, berry fruit), Blauer Portugieser (soft and easy drinking) and St Laurent (similar to Pinot Noir). I’m obsessed. So much so, that (I still haven’t had time to) I’m insisting on going to Les Caves de Pyrene in Guildford to get some. it’s biodynamic! – (what does this mean?) – Biodynamic wines are made using the principles of biodynamic viticulture. In essence, its a more “spiritual” version of organic farming. It takes into account for example, the lunar system (and even astrological influence), the vineyard as a specific ecosystem. Also, the wine isn’t manipulated – e.g. acidity isn’t adjusted. It’s a Chardonnay. I don’t discriminate between grapes, but it’s one of my favourite grape varieties. And this is an outstanding example. It’s suitable for vegans and vegetarians. Andreas has beautiful vineyards bursting with life – I haven’t personally been but he says you can feel the energy with the riot of plants, herbs and flowers growing amongst the vines. The vines are trained up and down slopes, but also unusually for this region, on terraces across the slopes. The reason I love this wine so much is that it has a highly unusual quality that I have never before come across. It has a sense of “garrigue”. This normally refers to the lavender/rosemary plants of the South of France which transfer to red wine, but in this case, also shows itself in this Chardonnay. A gold shimmering colour. Gentle yet bold flavours on the nose of orange citrus fruit, blossom and wheat and rich toasted almost honey-ed brioche. In the mouth it is full, buttery and creamy with an exceptionally long finish.